All music written by George Lewis. Recorded, mixed, and edited by Shawn Pierce for Maximum Music Ltd. Recorded at Blue Wave Studios, Vanocuver, BC, Canada, October 20-22, 1999. Selected four times to Coda Magazine's Writers' Choice lists! "Six long tracks illuminate the fertile mind of cutting-edge trombonist George Lewis, who grazes avant-garde territory as he roars and rumbles in the company of Vancouver's NOW troops -- 14 strong and abetted here by the spooky voice of Kate Hammett-Vaughan. ... This is where new music, classical and jazz frontiers merge, and amid the chaos, you'll hear fascinating contributions from saxist Graham Ord, trumpeter John Korsrud, cellist Peggy Lee and guitarist Ron Samworth." "Certainly no other Canadian outfit could respond to the substance and spirit of Lewis's ideas as sympathetically. Typical of its resources, each member is showcased in one or another of the six Lewis compositions here." 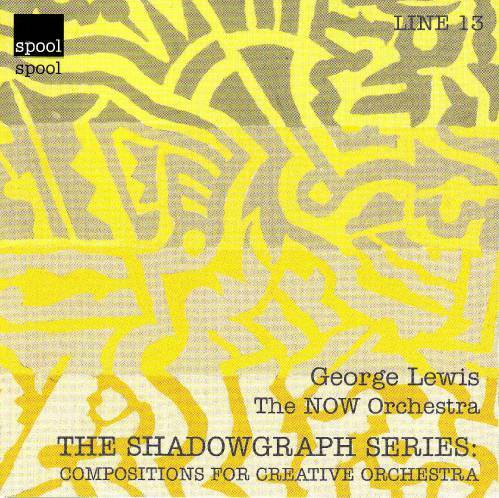 "Although the NOW Orchestra's previous CD was titled WOWOW, it is this one, The Shadowgraph Series: compositions for Creative Orchestra, which deserves all the wowing. ... This CD reaffirms The NOW Orchestra's leading position as one of the best creative orchestras around." "Though a great trombone player, AACMer Lewis's compositional river has always run deep. A joyous event for George to get a full compliment of West Coast improvisers in a Vancouver based orchestra to work his concep"
"All of the pieces on this recording were written by Lewis, who once again shows himself to be a sophisticated and wide-ranging writer, incorporating a plethora of influences from swing to avant-garde jazz and even postmodern classical music. ... When he is in top form, as on his edifying "Smashing Clusters." fireworks explode as he seamlessly blends composition and improvisation." "Lewis, it should be pointed out, also plays some extraordinary trombone on these pieces. On "Hello, Goodbye," amid a delightful jumble, he provides a trombone flurry of unrivalled mastery. Or on "Shadowgraph 3" he tears through the ensemble with ferocious power." "The highlight (of Seattle's Earshot Jazz Festival) -and it was a stunner- was the sprawling concert of original music ... by trombonist George Lewis, played by Vancouver's NOW Orchestra. The well-honed but wild and wooly orchestra seem to breathe along with the creative and dynamic Lewis."